I build a lot of projects using plans from woodworking magazines. I also build a lot of projects from scratch. To build a duplicate from scratch project I usually have to start over because all the drawings, sketchs, etc, that I used are long gone. Would like very much to have complete plans of those projects. Little over a year ago I started trying to learn SketchUp. I even went to a woodworking show in Chicago because they were having hands on SketchUp training. Was helpful and I've learned enough to sketch picture of projects but didn't get enough time with those people. Didn't learn enough to manage componets, show joints, etc. So I was wondering if anyone else had an interest in learning more about SketchUp. Maybe a group of us could arrange for a SketchUp expert to provide training for a Day or two. Maybe meet at a central location and pay an expert $100 bucks ea (enough to make it worth their time). I'd be willing to travel a few hundred miles. Maybe someone reading this post is an expert? So give me a shout if anyone is interested. Its a great idea, and if I was within shooting distance from you I would be in on it. Good luck with it, and hopefully more will chime in with more useful comments. If we got enough interested in sketchup maybe we could start a new board on here. I tried Sketchup, but I get too frustrated with it and other CAD pgms. I learned drafting on a board many years ago, and still prefer the old fashioned way. I guess I'm just too old to change now. If you do a google search on Sketchup Tutorials, you should have more than enough info to get you going. YouTube is also a good source. That is how I learned. 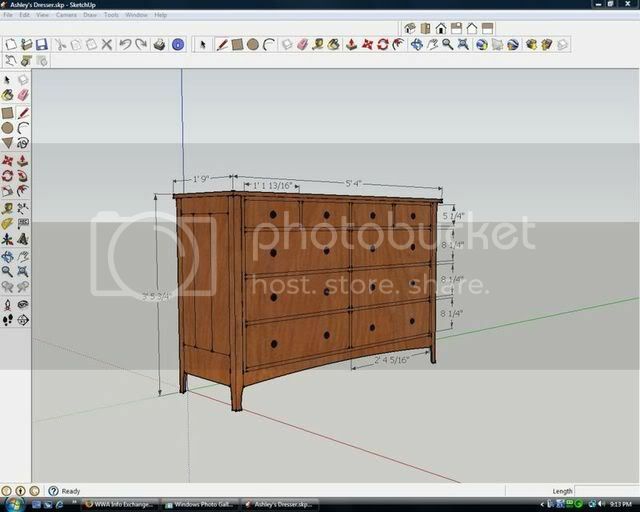 I am no expert at Sketchup, but I can make my own woodworking plans with dimensions on it. Ag, sounds like a good idea. I tried the software and gave up. I had a drafting table in the shop until I needed the room. Now I sit at the kitchen table and draw up my plans. Washington state in May 2010.
one of the things I like about sketchup is the ability to quickly make changes and show the changes to a potential customer.... with my laptop I was able to show the following to my Chief and then he could give input and then within 20 seconds or so I could show him different sized frames, how the frames could be spaced differently, etc etc. another advantage was that I did not have to do the math for figuring out the spacing as it was automatically figured out by the computer for me... less math means more time actually cutting wood... and the customer got EXACTLY what they wanted. As others have suggested, watch some tutorials. Sketchup is a very different kind of program than more traditional CAD systems like AutoCAD. It has it's own "mindset". Unless you start to grok that view, Sketchup will be a struggle. Once you start to mesh with that view (and as I suggested, it's not at all like AutoCAD's view, which is just to make an electronic drafting board), it will be a lot easier to use. If you insist on using it like an electronic version of a drafting board, it will always be a battle. I'm not doing anything right now with SketchUp. Been busy with the bed. Last time I was fooling with it I was trying to make componets and groups. I can make each but can not get those to save in model. Of course that's only one problem I was having and probably won't remember all the problems unless I start working on another project in SketchUp. Dresser I posted. Got the drawing and outside measurements but wasn't able to do it in componets and explode form showing all joints, etc. Well having trouble getting the image from computer to photobucket. maybe will send e-mail. Let me know if you get. Sketchup saves a image in it's own format (*.skp ) which is likely the problem. A easy alternative is to capture a screen shot using the Windows "Snipping Tool", which is included in the "Accessories" folder in Windows Vista (Start, All Programs, Accessories ). It will permit you to capture the entire screen, a selected area, etc., and save it as a *.jpg image. Very useful for things like this, and I keep a shortcut for it on the desktop. If you're not using Vista, there are other free screen capture utilities available from CNET, etc. that do the same thing. Or he can go to File....Export...2d Graphic to get a jpeg of the current view. Save that to the computer then upload to photobucket. Lots of good examples there, but probably for slightly more experienced users. This is the drawing I worked from building Ashley's dresser. Made componets and groups but could not find in model later. Wanted to show all joints in exploded view. I recently changed to an iMAC. What a difference! I grew up using a drafting board also. I have been using TurboCAD for years and decided to get get the mac version. Well it was a disapointment. It is more like a sketching tool than a CAD program. I have tried several other packages and was not to thrilled with any of them. The best I have come across that I like is HighDesign. It is more of a CAd tool. I tried Sketchup but that is not what I wanted either. I guess I am just picky. I could set the mac up to run windows programs but I am resisting that also. Right now it is pencil and paper. One of these days I will bit the bullet and get a software package again.